Gold Chat: Are increased Indian scrap levels actually smuggled gold? Are increased Indian scrap levels actually smuggled gold? This theory was emailed to me by a reader and I thought it worthy of a wider audience. 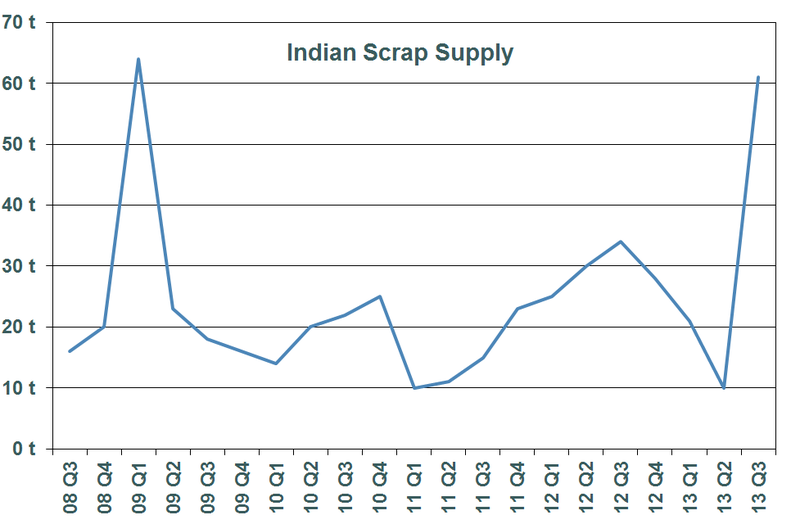 The chart below shows the WGC's estimates of supply of scrap inside India. Note the sudden increase in the third quater of 2013, which is significantly above the usual amount. "When the gold price initially spiked in late 2008/early 2009, the local media were talking of a sizeable correction (not just in rupee terms, but also in $US terms). This is a key reason why recycling activity was so strong at that time - local scrap dealers reported queues stretching for blocks. The magnitude of this selling back reflected a belief that the jewellery could be repurchased at more attractive price levels at a later date." "Indian Jewelers will not want the Indian Government to think their gold import tax policy is not working. Thus, gold purchased from smugglers will be increasingly reported by jewelers as Scrap/Recycled and they will report record demand of Indians turning in their old jewelry to be updated to new, fashionable designs." I find this explanation compelling, considering that a jeweller acquiring smuggled gold needs a cover story to explain how they got that gold, and claiming it was scrap is a good (and unverifiable) way to do that. I will be interesting to see the amount of Indian scrap the WGC reports in their Q4 2013 Demand Trends report when it comes out in a couple of months. hm, in case a jeweler buys up scrap gold, why does he? 1.) Make jewelry out of them and sell them (remember, that's his main profession and income), why on earth would he want to report on the purchase, since he would also have to report on the sale and pay taxes. Makes absolutely no sense. 2.) Sell to "scrap" to a refinery, in that case probably not possible to get arround reporting/paperwork, but on the other hand that means, nobody is buying enough gold jewelry. So either way, does not really add up to me under the assumption that indians love gold (jewelry). It would be interesting to see the fine print on "Scrap" definition, treatment within the tax regulations (which I gather are by their nature designed with "interpretation" loopholes) and how "scrap" affects the perception and reality of the interplay between government regulators and Jewelers. Sorry, a bit wordy here but trying to be clear. You may have to deal with an Indian tax accountant/lawyer on the ground for the finer points regarding this and even then it would depend on the accountant/lawyer and the circumstances. I'm assuming a portion of the smuggled gold has to show up in this scrap category. What the rules are regarding "identity trail" of who the jeweler purchased or sold to is also of interest. The normal "gaming" of whether the transactions are settled in whole or in part "in Kind" could only make a tax lawyer happy. For the government and their regulators just trying to get an reasonably accurate picture of the jeweler's profits is task enough. In my view, India is an interesting "canary" in the gold trade. The onerous Indian gold duties and regulations play a large part in manipulating international gold supply/demand/price reality and perception. Local elections loom within 6 months. A new political party may change the political calculations (this is a possible large black swan). American treatment of Indian diplomat causes feeling of being disrespected. Can these gold "corralling" techniques survive? This may become a case of the spirit is willing but the flesh is weak. The spirit in this case is an elite supporting (willingly, unwillingly or whatever) fiat currency games. The flesh is a pissed off electorate. Interesting information. Personally I would assume the dealers themselves employ the smugglers. I can't imagine the margin between the purchase price of smuggled gold and the scrap price a dealer would pay is big enough to be a viable business for a middle man.